Commentary on the Tennis, on the BBC today, was done by Nick Lester and Mark Petchey. World feed. It will be Petchey and Robbie Koenig on today's highlights assuming they show Edmund v Dimitrov. 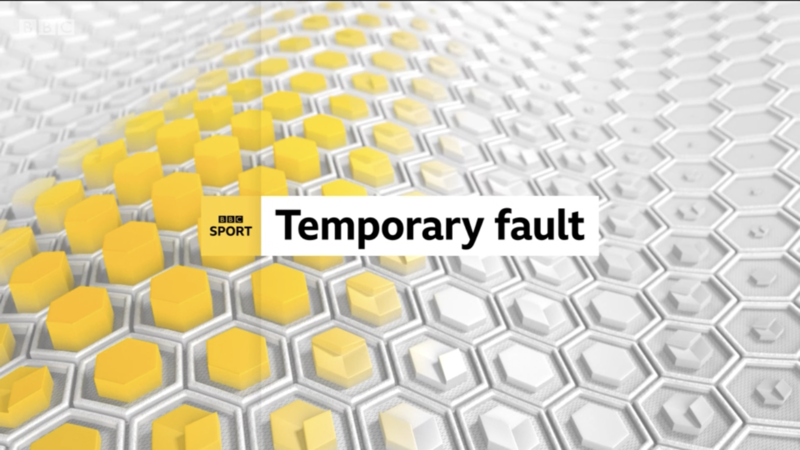 BBC Sport Temporary Fault slide - as seen today on the Rugby League Challenge Cup First Round match - which is showing live on BBC Sport Online this afternoon. The BBC put their own commentary on today with Andrew Castle and John Lloyd. Same tomorrow I expect. Andrew Castle won't be going to Spain for the Davis Cup net weekend, the commentary team is Chris Bradnam, John Lloyd and Jamie Baker according to DigiGuide. I doubt any of them will actually get to go to Spain. Looks like the vast majority of the coverage on the red button with just 1-3pm on Friday and 1-3.30pm on Saturday scheduled on BBC2. There's a Sunday slot on BBC Two also. If I remember correctly the away tie before that, with Serbia in 2016 was done from Salford with only Russell Fuller sent to Belgrade as they did with Canada. Nice new set for eir Sport for their GAA pregame show - after using variations on the same design since the late 2000s. If you have access to the Eurosport App, it's well worth watching the final hour of the world feed of the Mens Singles Final, seeing what happens in the hour post winning the trophy. Includes an interview with Swiss TV, an appearance on MCA for invitees, the crowd walk and Ch7 interviewing from their OB position which was relayed to the crowd below before the feed was dropped. While there’s still no official announcement, it appears confirmed by Sky’s own website that they have picked up the rights to Australian Rugby League previously held by Premier Sports/Eir Sport. Seems they will be broadcasting a double bill each Saturday morning. It says its a multi-year deal but doesn't specify the length. From a post on Digitalspy, it seems that 2 IPL matches per day will clash with it each other from this year as well, with the second match starting before the first has finished. Oh joy! The annual visit of the FA Cup draw to the One Show. Someone round here will be delighted! !